Nokie Edwards was the one who inspired me to play Ventures tunes some 50 years ago. Never be able to master my guitar skill but at least I can say that I have met the "Maestro" himself who inspired me. I had the great pleasure and honor to meet with Nokie in 2007 at his 72th birthday party in a small town called Florence near Salem, Oregon and many more times later. After our 1st meeting, I started to collect some of his personal guitars. Nokie loved to try different guitars / basses during his career. He was a Telecaster guys when he played lead with other bands or his. He used a Fender P-Bass when he was asked to join The Ventures Band. Most of his previously used guitars were long gone when I met with him in 2007. But I was fortunate to get a few from him. He was busily involved in his own creation of "HitchHiker" guitar when I met him in 2007. Normally, when we talk about Nokie Edwards' HitchHiker guitar, we all think of the electric guitar he currently play on stages or at concerts like this one. 1)Electric guitars: It has three generations. Started with Chavel Custom Shop (before they were bough out by Fender), then made by Rock Creek Guitar Company in Oregon, and now made in Japan by Aria. Not sure how many HitchHikers were made. My guess is between 50-100, maybe more. I do not own an Aria HitchHiker model but played one once. The one with whammy bar is really nice. 2)Steel string acoustic guitar: Made by Santa Cruz (based on Santa Cruz FS Model but with HitchHiker head stock). I believe only 3 have been made. Nokie has one (unless he sold it later on), I've got one and he sold one to someone in Japan. Nokie used this guitar for recording quite often. 3)Classical nylon string guitar: Made by a guitar luthier Roger Stuckless in Canada. I believe only this one was made. How do they sound? I will let you judge yourself. Here is the photo of Nokie played Rock Creek prototype. Unfortunately, there was no recording of the playing. I am not sure the HitchHiker Nokie played at Mark Moseley's recording studio was made by Rock Creek or Aria Japan. (Probably an new Aria?) I think Mark is nephew of late Semie Moseley. Nokie uses his studio for most of his recording. I don't think Nokie ever performed Roger Stuckless HitchHiker Classical on stage. That guitar is way too valuable to carry on the road. Ventures Concert in Los Angles 1984: "El Bimbo"
More about Nokie Edwards' other personal guitars later. It should be Charvel not Chavel. Sorry for the typo. This photo appeared in September 1981 Guitar Player Magazine had caught some Ventures fans' eyes. That was a guitar made by Tony Hunt; a small luthier in Arkansas. Tony knew and worked with Semie Moseley in Mosrite factories. Tony made two guitars for Nokie Edwards. One is the one in the above photo. It has a Scruggs tuning peg on low E, Bigsby palm pedals on 2nd and 3rd strings. 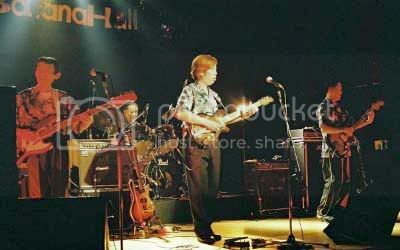 Nokie played that guitar at 1984 Ventures concert in Japan with Gerry McGee on bass. The other is the guitar Nokie played and recorded for this CD in 1990 with a well known Japanese guitarist; Terry Terauchi. (CD title: "Guitar war between US and Japan") It also has a Scruggs tuning peg on low E, but no Bigsby palm pedals on 2nd and 3rd strings. My Japanese friend Ten provided the above info and was kind enough to send me the above CD. Domo, Ten San. I am very lucky to have this guitar in my collection directly from Nokie. Here are photos of this guitar. Excellent - Please keep these coming! There is a Tony Hunt guitar for sale on eBay right now. (sale ends 12/22/15) The seller included some of my posted photos on his listing. I guess he is trying to tell potential buyers that Nokie used to play Tony Hunt guitars. He did the same thing three years ago, this time he did not mention my pen name "Desert Surfer". I am not the seller nor have any relationship with this eBay seller. Thank you for the pictures; Nokie has long, long been deeply respected and admired, from the.